Over the last couple of weeks we have found ourselves drawn repeatedly like a magnet to Arabisk on the Coventry Road, by my reckoning we have eaten there 3 times in the last 2 weeks so it’s probably no spoiler to you that its obvious we seem to be enjoying our Arabisk experience! Arabisk is located in the heart of the Arabic restaurant quarter on the Coventry Road in Small Heath opposite old favourites including Bader and Abu Zayd. It’s not the largest of restaurants but has recently been expanded through the addition of a new upstairs family room which was much-needed particularly for family diners as downstairs seems to be dominated by male only dining parties during peak times which can make any restaurant feel like a no go zone for families! Lets hope the family room stays a family room and doesn’t become a spill over area for large groups of men! There is nothing spectacular about Arabisk from a decor perspective, its clean and simple and in all honesty that’s all I want. Birmingham has plenty of fancy restaurants. Call me old-fashioned I just want great food and good customer service at a competitive price and this is where Arabisk really delivers outstanding value. So what about the food I hear you cry! The first thing I have to say is I haven’t even scratched the service of the wide range of food on offer at Arabisk which offers a really wide-ranging offer of cold and hot starters with a much wider vegetarian selection than we are used to from many middle eastern restaurants particularly in Birmingham which are very meat dominated. For mains there is a wide selection of vegetarian, chicken, lamb, grilled dishes as well as a range of fish and salad options to keep the most demanding of diners interested. Both their chicken and lamb shawarma hits the spot, I definitely have a soft spot for the chicken over the lamb. Shawarma can be ordered as a light sandwich option or as part of a main meal which comes with a choice of rice or fries as well as Lebanese bread and salad. Middle Eastern restaurants have a much better concept of what constitutes a salad compared to many South Asian restaurants where it can be as basic as a chopped up onion accompanied by slices and slices of cucumber that have seen better days which would be of no use to refresh your eyes as they have dried out due to lack of any salad love! The mixed grill meal which includes lamb cubes, a skewered kebab, and chicken cubes is a real winner on the menu. It comes again with a choice of sides and a salad and quite often you will find that the staff will add some chicken wings or shawarma to the mix as I have had on a couple of occasions. Rice options are plentiful, you don’t get the standard token one type of rice but you get a choice of up to four different rice options which is great. One of the challenges of middle eastern food can be that the mains can be rather dry especially for a South Asian palette, this is where Arabisk definitely excels against its middle eastern competition on the Coventry Road. There is no problem in getting some vegetables in sauce to accompany your rice and if the initial serving is not to your satisfaction they have never quibbled in offering more, its a small touch but it makes a big difference. They also serve an amazing chilli sauce and garlic mayonnaise which will definitely have you asking for second helpings. Service at Arabisk is excellent, the customer service staff are helpful, friendly and nothing is too much effort. The chefs behind the counter are friendly, not afraid to encourage you to try something different and there seems to be a positive vibe at the restaurant which we really like. We do have to warn you, the restaurant does get busy post Jummah and in the evenings and its easy to see why when you have good quality food with generous portions served at excellent prices. During these times you need to be prepared to both wait for your food and sometimes even wait for a table. If you’re eating in smaller parties of two you might have to eat with another group of diners if you want a seated table but if its good enough for Wagamama its good enough for Small Heath! This in our opinion is no deal breaker and for me it just gives me more confidence that we’re eating in a restaurant that is popular amongst locals. Arabisk really delivered for us at the Halal Food Review and the proof of the pudding is that I’ve eaten there three times in less than a fortnight both with friends and the family. When I ate with the wife the staff made a point to let me know that their new family dining area will open soon and true to their word it is now open. If you’ve not tried Arabisk then I would definitely recommend it the next time you visit the Arabic quarter on the Coventry Road. If you’re not the type to wait for a table then avoid eating after Friday prayers. Arabisk is a wonderful addition to the Middle Eastern dining offer in the city offering a really diverse menu with generous portions at a very reasonable price! One of the things we love about our work at the Halal Food Review is the interaction we have with our readers on Facebook and Twitter and one thing that is really clear to us is that some of our most serious foodies are female! Our female readers are passionate about their food, vocal in their opinions and have a great eye for detail. So if any of our female foodies want to write for the Halal Food Review get in touch via Twitter or Facebook and share your views and you never know you might get a call from the HFR to pen our next review. That shout out to our female readers brings us on to our latest review which is written by Halal Food Review correspondent Shabana Qamar. 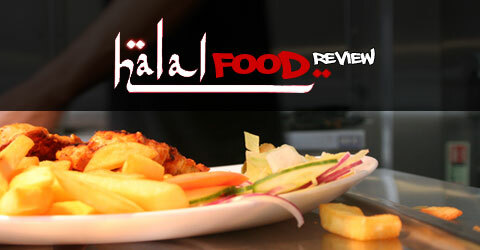 Readers with a long term memory will remember her from our review of Chaii in Birmingham. You would be forgiven for not noticing Basha amongst the hustle and bustle of Coventry roads Arab eateries in fact I have probably walked past it numerous times until a friend suggested we eat there. I was quite apprehensive as it looked like a male dominated cafe rather than a welcoming restaurant but when the sign read ‘Arabian/Turkish’ cuisine I did think oh this could be different. Basha is located a few doors down from Bader which is a firm favourite of the Halal Food Review and opposite Pastry House on the Coventry Road in Small Heath, Birmingham. When walking in to Basha you are faced with a really small room with a counter full of tempting desserts so I was somewhat puzzled as to where the actual ‘Turkish cuisine’ was! We were greeted by a waiter with an unexpected traditional Turkish top hat (we did get into a slight debate as to whether it was Turkish or Moroccan but if you have seen Tommy Cooper’s stand up you will know what I am referring to). We were lead to the back of the cafe where I must say I was surprised to see a spacious well decorated room stretch out before us. It was only then we noticed how empty it was considering we arrived straight after Jummah prayers which is the busiest time for most restaurants on the Coventry Road as the hungry masses from the mosque head out to eat and socialise! Without wishing to burst anyone’s bubble I am not a big fan of romantic dim lighting I don’t care how ugly my company is I still want to see their faces! When presented with the menu I was pretty disappointed, I didn’t see anything ‘different’ neither did it shout TURKISH at me unless you included the grilled kebabs? I would compare it very much to the likes of Bader or Abu Zayd but even then their menus have more combinations and variety on offer. I was also struck by the rather odd baguette and Panini options which seem better suited to the cafe than the restaurant. We opted for the mixed mezze starter along with the meat kabsa with rice and the barbecued chicken with fries for mains option. We decided to wait and see if we had enough space in the belly for dessert which I usually don’t after eating on Coventry road unless I decided to take a brisk walk to Asda and back! The waiter with the traditional Turkish/Moroccan hat was quite friendly and in all fairness all the staff were smiley and pleasant. Our food came out almost instantaneously which wasn’t surprising seeing as there were only 2 other people in the restaurant at the time we ate. Our starter was your standard mixed mezze which included hummus, falafels, vine wraps (name I forget) and a salad which all tasted fine. The falafel for my own personal taste was a little too oily and the hummus was a little too lightly spread for my liking I prefer my hummus to come in more generous servings! The mains came out shortly after and the portion sizes were as big as I would expect from our Arab/Turkish brethren. The fries had some kind of chilli spice sprinkled over them which I actually liked but some may not as it can dominate the taste of the fries. The chicken was well cooked but lacked a depth of flavour. I couldn’t figure out any distinct spices and I was expecting at least a subtle barbecued flavour but what came out was rather bland in terms of flavour. With the meat kabsa on the other hand it was very well spiced, beautifully seasoned and the meat was well cooked. My only issue here was that I didn’t realise the meat is mixed into the rice so for me it became a bit stodgy I prefer the rice and meat to be separated. Overall our food experience was average, on the plus side service was good and we were given courtesy cinnamon tea during our mains which I thought was a nice gesture. The total bill for our starter and 2 mains came to £17 which is reasonable for what we received. What you make of Basha is entirely dependent on your expectations from Arab/Turkish cuisine and given the local competition from established rivals such as Bader, Abu Zayd and Momo’s you can’t help feel that Basha needs to offer something different or extra special to convince people to give up their loyalties. If you fancy somewhere quiet to get away from the hustle and bustle of the Coventry Road then Basha offers that. Salaams and welcome back to the Halal Blogosphere. After a couple of mixed noodle reviews its back to our old haunt of the Coventry Road and a review of Bader Restaurant offering traditional Arabic and Lebanese cuisine in the heart of Small Heath. As far as Arabic and Lebanese cuisine goes Bader offers both the widest choice and the most authentic dining experience from the options available in Small Heath. The restaurant retains a number of design features incorporating textiles and patterns from the middle east. When you enter the restaurant you are greeted by a traditional Arabic seating area to your right which is extremely handy as Bader tends to get filled to capacity very quickly particularly on Fridays after the post Friday prayer rush. We had a group of six diners arrive in the peak time rush post prayers and the staff were very accommodating in rearranging diners to allow us to find a place where we could sit. I don’t know how accommodated the diners who were moved felt but we were very appreciative! One of the challenges of the Bader menu is the sheer choice from starters to the mains as well as the various grill and dessert options. For starters we decided to go for a Mix Maza which included Houmous, Falafel, Stuffed Vine Leaves as well as a Tabbouleh salad and traditional Arabic breads. The beauty of the Mix Maza was there was no meat in sight! Its to easy to go to an Arabic or Lebanese restaurant and not really try out some of the outstanding vegetarian options, I would definitely recommend people experiment with their starters even if they are not prepared to sacrifice the meat from the main courses! The starter was excellent, the portion size is more than suitable for a group of 3 to 4 people but it does become limiting when you have six very hungry diners! For larger groups I’d suggest ordering a wider selection of starters. For our mains our table ordered mixed grilled kebabs, shawarma and baked salmon. The mains came with a variety of side dishes including rice, fries and salads. There was a slight problem with my order of baked salmon where I requested fries but received a giant portion of rice instead. The waiter promised to bring over replacement fries but they never arrived which whilst not the end of the world is not great customer service! The frustration only grew as Arabic rice tends to come with no accompanying sauces which to the Desi palette borders on food blasphemy! Whilst the rice failed to meet my expectations the salmon was excellent, perfectly cooked with a rich sauce that I wished there was more of! The side salad I ordered was also rather limited to the culinary delights of the very traditional English lettuce which left me yearning for Arabic flavour! The dishes around the table were tried and tested and delivered against expectations. Again if there was to be a criticism it would be that rice and meat mains do require an accompanying sauce or condiment e.g. gravy. The flavours of Arabic starters can often be missing in the main dishes particularly the grill options. Service was mixed, the restaurant was exceptionally busy after Friday prayers which merits giving the waiting service the benefit of some doubt but small errors like forgetting to bring food out is just a basic error that can happen when a restuarant is not busy. Prices at Bader are competitive, slightly higher than prices you may pay at other local Arabic restaurants but this is more than compensated by the dining experience and the range of choices available that are not matched by rivals in the area. For families there is a small seating area at the back for families and female diners who wish to eat in a segregated environment. I still hold our hope that restaurants can become more family friendly, there are very few halal restaurants in the city that you feel comfortable entertaining friends or family particularly female family members as so many places have become male dominated. This isn’t necessarily the fault of the restaurant owners but something you would hope can be addressed. One of the exceptions to the rule is Dubai Express which provides a really ambient dining experience but struggles with a whole host of other problems as testified by the range of reader comments on our review. General observations aside, Bader definitely gets a thumbs up!